GOF personnel checking the 509 cartons of smuggled cigarettes confiscated during ‘Op Libas’ last Tuesday. Supt Sanudin Mohd Isa (centre) at a press conference held at Battalion 10 General Operations Force (GOF) Lanang Camp, yesterday. 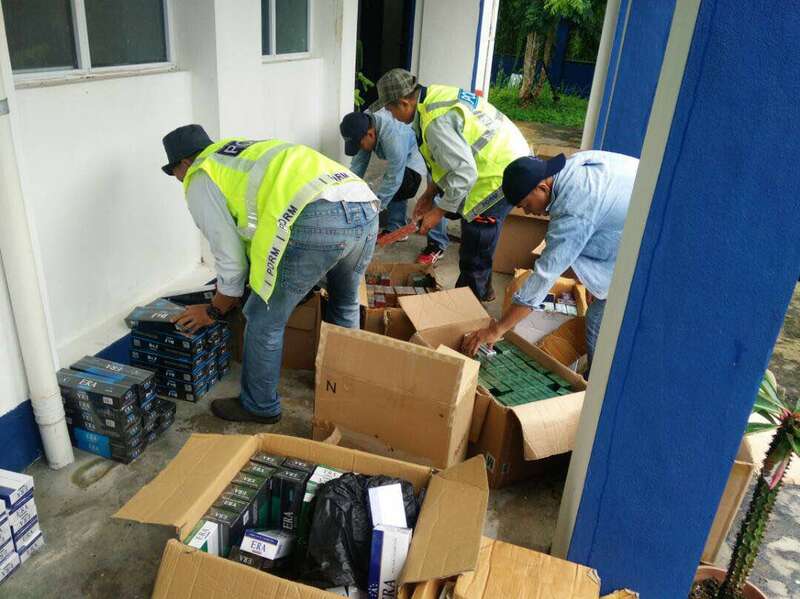 SIBU: Some 509 cartons of cigarettes with an estimated value of RM50,000 which are believed to have been smuggled in was confiscated by the 10th Battalion General Operations Force (PGA) in a market at Selangau near here during ‘Op Libas’ last Tuesday. The Commanding Officer of the 10th Battalion GOF, Supt Sanudin Mohd Isa said at about 10am on Tuesday an 11-member team comprising GOF and police personnel led by Inspector Hafizhazman Hassan inspected a van parked at a car park in Selangau town. “During the inspection a man was trying to unload several boxes of cigarettes from the van. Inspector Hafizhazman and his men then detained the man and discovered that a large number of cigarette boxes which were suspected to have been smuggled in were inside the van,” Sanudin said during a press conference held 10th Battalion GOF Lanang Camp here, yesterday. He added that the suspect, van and cigarettes boxes have been taken to Selangau Police Station for further actions by the police and Customs Department. RM50,000 worth of smuggled fags confiscated 0 out of 5 based on 0 ratings. 0 user reviews. Know where Mohd Nick Rafael’s mother is?